Custom stone fountains are our speciality. The design options are virtually endless. If you can imagine it, we can probably create it! 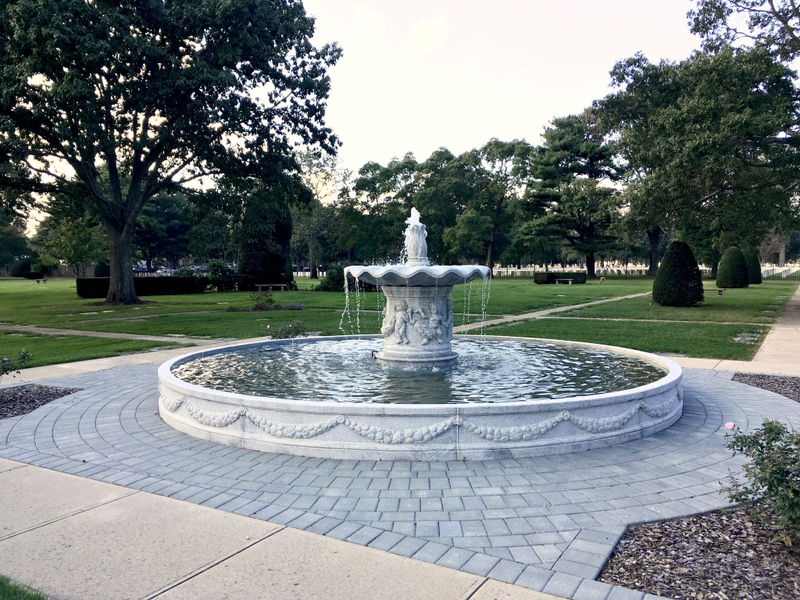 The photos in this blog are from a project we worked on from start to finish for Pinelawn Memorial Park on Long Island. 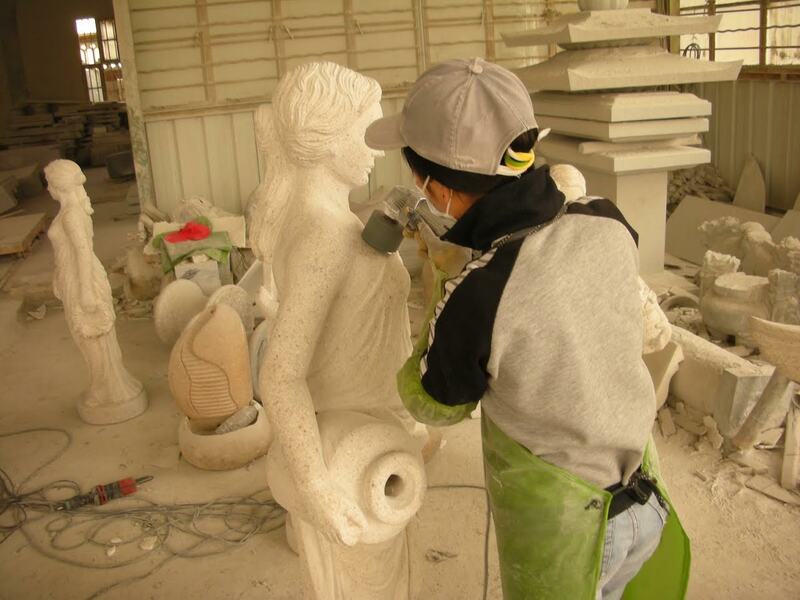 The process outlined is typical for most custom fountain projects. 1. 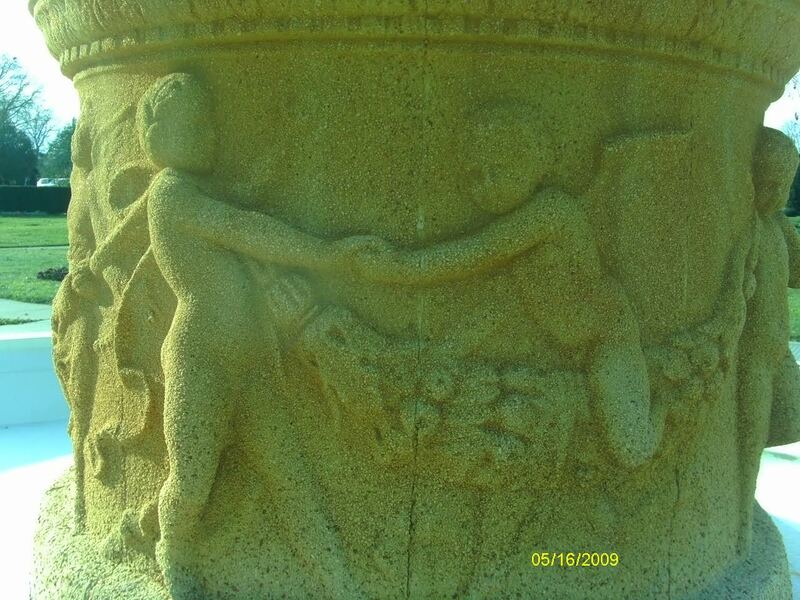 The process typically starts with the customer sharing a photo of a fountain they would like replaced or replicated. You can find your inspiration in our idea galleries or from photos of classical fountains from around the world. 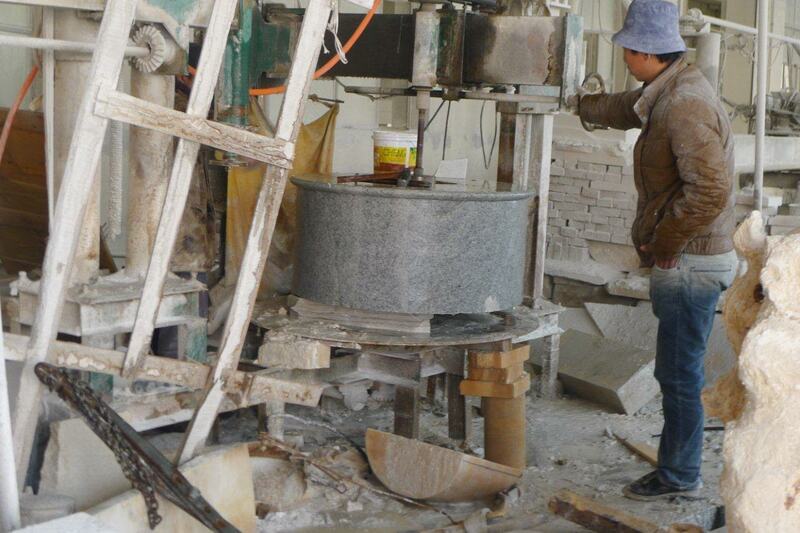 The photos below are of a deteriorating concrete fountain. 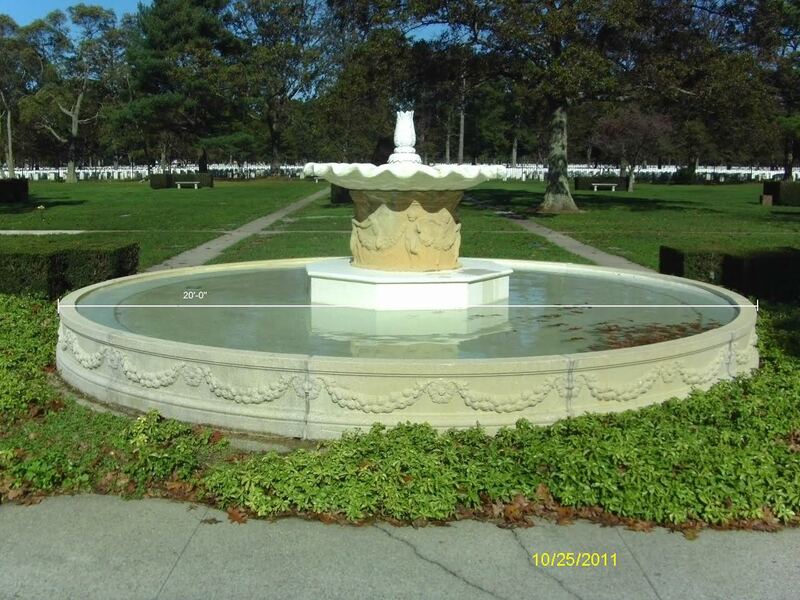 Pinelawn Memorial Park asked us to replicate this fountain in durable granite. 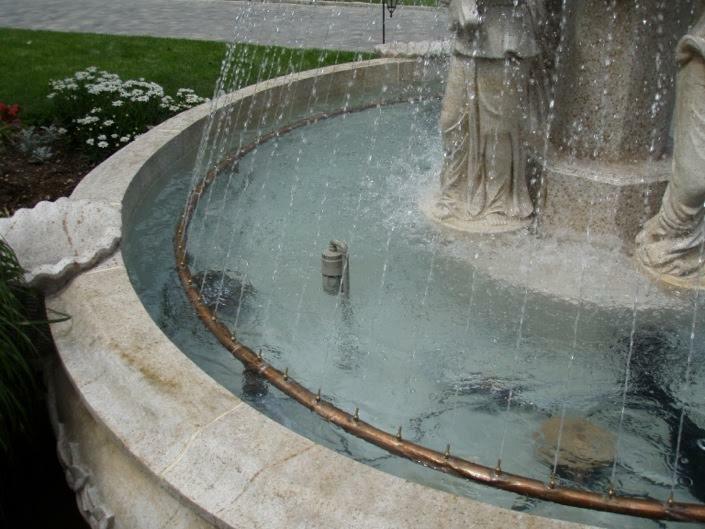 Granite is the best option for outdoor fountains, especially in climates with a freeze/thaw cycle, but we can create fountains from a variety of stones. The before picture shows the concrete fountains wear and crumbling details. 2. 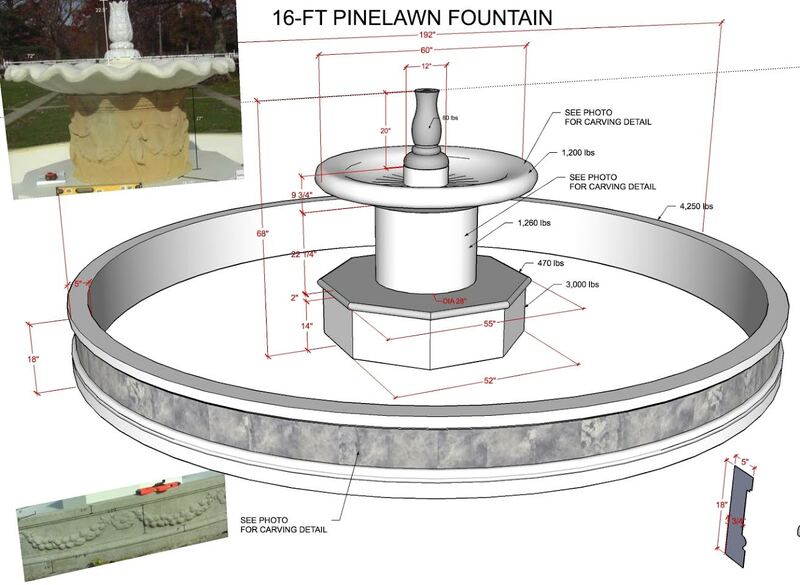 After taking measurements, we put together a rough sketch of the new fountain and provide initial cost estimates. 3. To help us determine the appropriate scale for the fountain design, we request that customers send us a recent photo of the proposed fountain site. By giving us a known height or distance of an object in the photo and using a little Photoshop magic, we are able to place the proposed fountain design in the photo. At this stage, it is easier to determine if the fountain will be too large or too small for the area and scale it appropriately. This is also the time where we play with stone color tones in the rendering to give a better representation of how different colors will look in relation to the home or other landscape elements. We can even show the customer physical stone samples to aid in color selection. 4. Once the design, size and stone color is finalized, the bid is reviewed for any significant changes from the original scope of work. Then we write up a formal sales order. If time or budget are an issue, we may suggest one of our in-stock fountain creations as an alternative. 5. When the order is confirmed and down payment received, we begin our CAD process to model the fountain from the ground up. 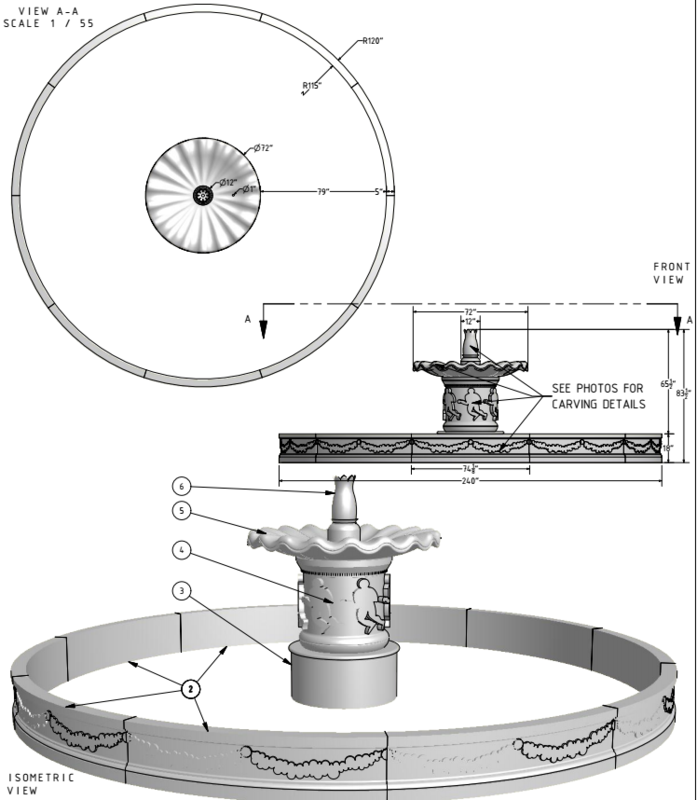 We use 3-D engineering software to create a 3-D rendering of the fountain design. We submit the design for review before continuing. 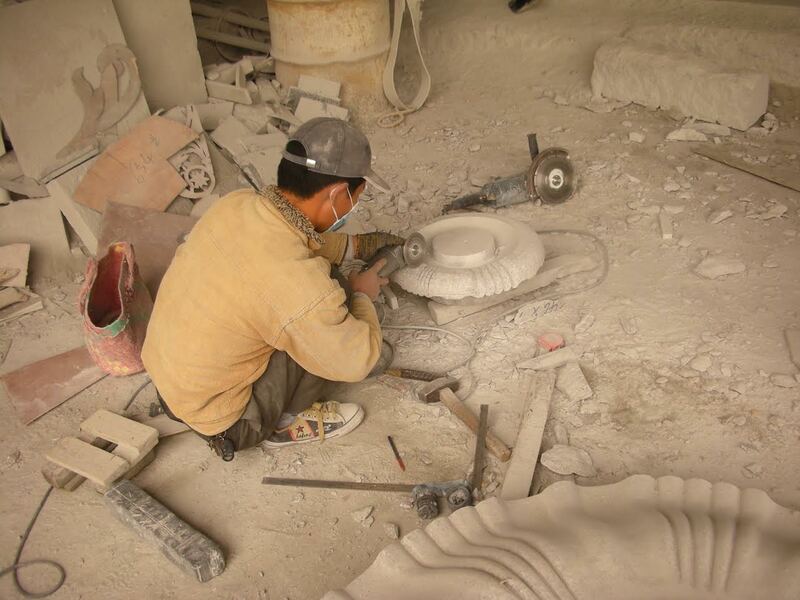 For many fountain design companies, this is where their design process ends. For us, the 3-D rendering is just the beginning. After the overall design is approved, we break it down even further into individual parts. We create drawings for each piece to ensure the carving features are exactly where you want them and all functionality, including plumbing and drains, is in the proper spots. Some stone fountains can weigh several thousand pounds. As a result, weve developed a unique lifting system designed right into each of the larger parts to make lifting the heavy fountain with the appropriate equipment easier. 6. 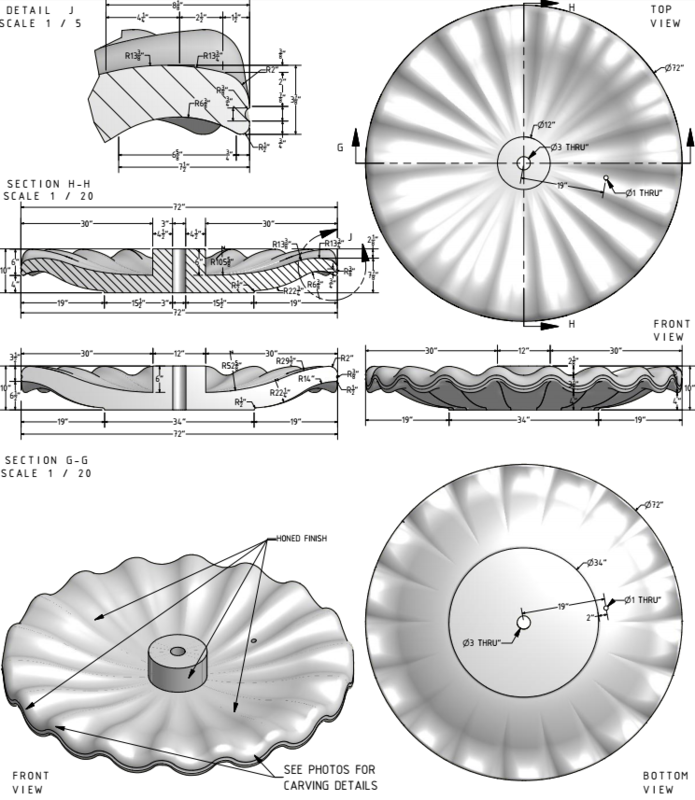 Depending on the client and contractors involvement in the design process, we submit all detailed part drawings or just the main assembly drawing with dimensions for approval. 7. 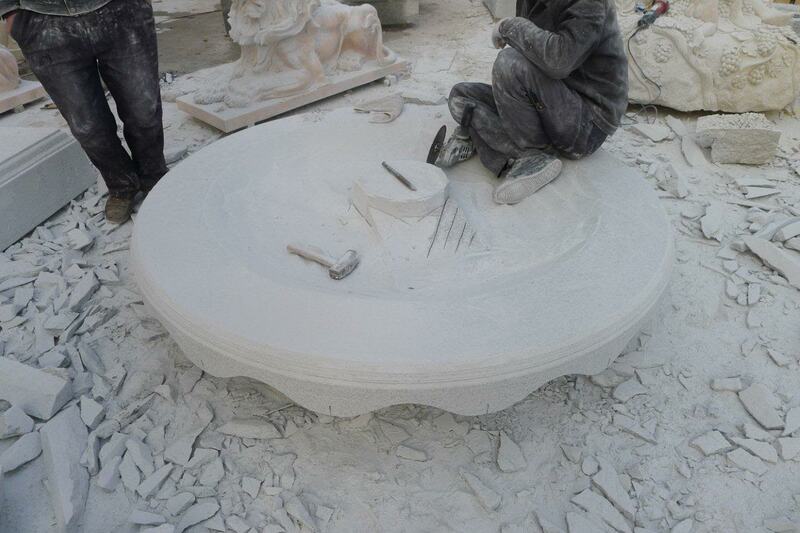 The approved drawings are then passed off to our skilled artisans who secure quarried blocks of stone, cut them to size, carve and hand finish the fountains details. 8. While carving is in progress, we follow up with additional drawings for the fountains plumbing, lighting and concrete slab layouts. 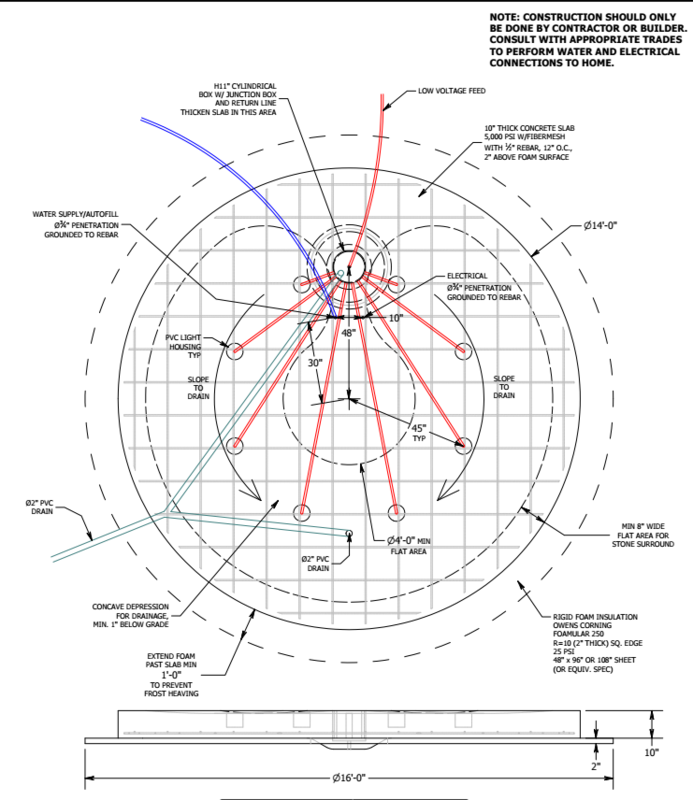 Following this set of plans ensures the custom fountain will function as intended when it is installed. 9. We can also add additional fountain accessories to the design, including remote pump vaults, autofill systems, water treatment systems, nozzles, spray rings and lighting assemblies. 10. After the fountain is complete, final payment is due. 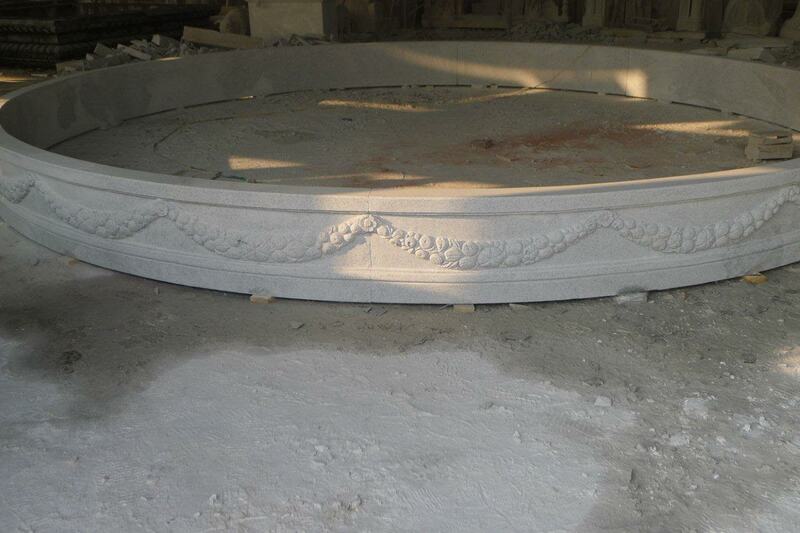 Then, we arrange to have all of the fountain pieces delivered to the fountain site and install it. 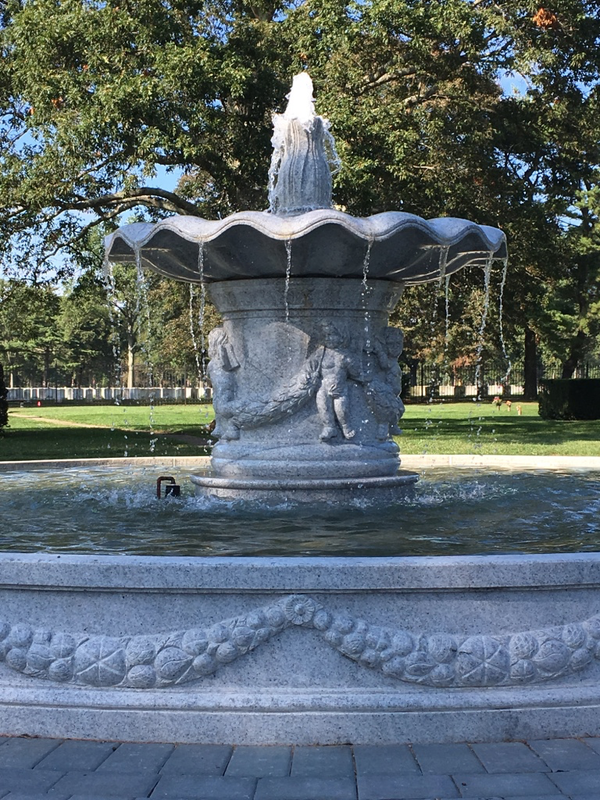 After installation is complete, a granite fountain can be enjoyed for generations to come! If you are interested in learning more about our custom design process, please contact us.